You’ll be transfered by coach from Strasbourg riverport to Remich, where you’ll board our ship at 6:00 p.m. After comfortably settling into your cabins, we’ll introduce our crew at a welcome cocktail. Join us for an evening of entertainment. This morning, join us for a guided tour of Luxembourg. We’ll leave from Remich for Luxembourg by coach. Luxembourg is a real mix of styles and cultures. Our panoramic tour will give you a good taste of what’s to be found: the old city, the fortress ruins, the European Convention Center, and the Banking District. We’ll then set out on a guided tour on foot to get a closer look at some of the sites, including the Place des Armes, Place de la Constitution, capital buildings, Corniche, old city, Grand Ducal Palace (exterior), and Place Guillaume II. After our tour, we'll return to the ship in Remich. This afternoon, join us for a visit to a winery complete with a tasting*. Seven pioneering men of the region recognized the magic of the huge calcareous rock downstream from Remich. They cultivated the first vineyards now infamous for its sparkling wines. In 1919, in the aftermath of World War I, they set up the Caves St Martin. You’ll discover the secrets to winemaking while strolling through the underground passages that seem to go on for miles. After our tour, we’ll go to the historical center of Remich where you can enjoy some free time on your own. Also called the “Pearl of the Moselle,” this charming city is surrounded by an outstanding panorama of vineyards and forests. Take a stroll along the several miles of promenade in the shade of the trees along the Moselle or sit back on a cozy terrace for some more wine. We'll return to the boat at 5:00 p.m. and begin to cruise to Saarburg. Join us for an evening of entertainment. 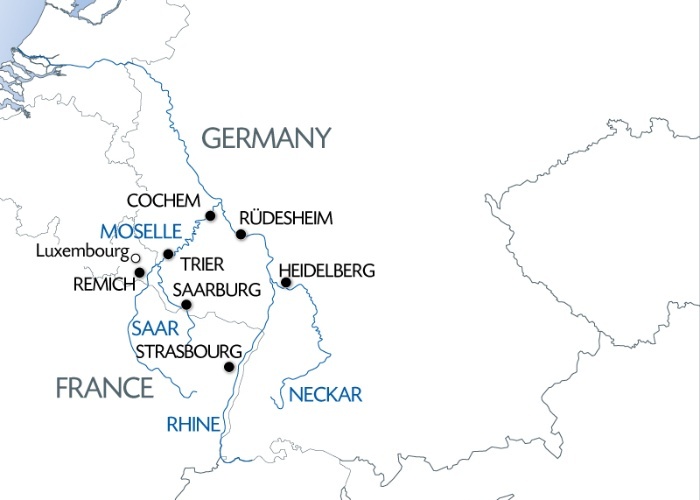 We’ll spend the morning cruising on the Sarre and the Moselle towards Trier. Our ship will arrive in Trier by late morning. This afternoon, join us for a guided tour of Trier. Discover the Roman vestiges and heritage in Trier, the splendid view the city offers of the Moselle, and its magnificent landscape. Trier is known for its well-preserved Roman and medieval buildings, but it is also home to some impressive churches as well. We’ll have a look at the amphitheater, the imperial baths, the Roman basilica, and the Porta Nigra, one of the best-preserved Roman city gates. After we return on board, we'll begin to cruise to Cochem. Join us for an evening of entertainment. We’ll arrive in Cochem early in the morning. Join us for a guided tour of Cochem Castle. You’ll be transferred to Cochem Castle on a mini-bus. The Imperial Castle sits on a mighty crag over the Moselle River. We’ll enjoy a guided tour of this magnificent building that dates back to 1000. After being destroyed by the French in the 17th century, it was rebuilt from scratch in a Neo-Gothic style by a local German businessman. Following our visit of the castle, enjoy some free time in the city. Take a stroll through the narrow, winding streets and enjoy the ambiance full of lovely half-timbered homes with slate roofs, the historic square near the town hall, and the early walls, gates, and churches. We’ll return on board on foot. The afternoon will be spent cruising the Moselle River, one of the most beautiful tributaries of the Rhine, towards Koblenz. Enjoy the calm as we pass by charming villages, vineyards, and what seems like a castle on every peak. Once we arrive at the end of the afternoon, explore the city with our host or hostess. The rest of the evening is yours to do as you please. This morning, we’ll pass through the beautiful and romantic Rhine Valley. Majestic castles, mysterious ruins, and famous vineyards dot the countryside known for its legendary German royalty and fabled Lorelei Rock. Our ship will arrive in Rüdesheim by late morning. In the afternoon, join us for a guided tour of Rüdesheim. First, we'll enjoy a guided tour of the local vineyards on a tourist train. Then, we’ll participate in a wine tasting* in the historic rooms of the Bassenheimer Hof. After, we’ll head to Siegfried's Mechanical Music Cabinet, located in a lovely, 15th-century building. This museum holds a collection of fascinating musical instruments ranging from tiny, delicate music boxes to an enormous orchestrion. After we return on board, we’ll begin to cruise to Mannheim. We'll arrive in Mannheim early in the morning. This will be our starting point for the excursion to Heidelberg. Known as the most romantic city in Germany, it has inspired many the painter and poet by its beauty. We’ll visit the partially ruined, red sandstone castle that sits majestically above the city, overlooking the Neckar River. Up to the Thirty Years’ War, Heidelberg boasted one of the most notable ensembles of buildings in the Holy Roman Empire. While time has taken its toll, this castle’s fame lives on to this day. The giant wine barrel is one of the most popular attractions. Built in a cellar in 1591, it held about 34,342 gallons of wine collected from the Palatinate in payment of taxes. The facade of the Friedrich Building, displaying a perfect gallery of portraits from the royal line, is also a must-see. After our visit, we’ll go to the historical center of the city to take in the many sites. Enjoy some free time before returning on board in Heidelberg. The afternoon will be spent cruising along the Neckar and Rhine Rivers towards Strasbourg. Tonight is our festive gala evening. Enjoy one last breakfast on board before disembarking at 9:00 a.m. End of our services. You’ll board our ship at 6 p.m. After comfortably settling into your cabins, we’ll introduce our crew at a welcome cocktail. Our ship will cast off at 7:00 p.m. for Mannheim. Join us for an evening of entertainment. We'll arrive in Mannheim early in the morning. This will be our starting point for the excursion to Heidelberg. The afternoon will be spent cruising along the Neckar and Rhine Rivers towards Rüdesheim, where we’ll arrive in the evening. The famous Drosselgasse with its numerous cafés, bars, and music awaits you tonight! This morning, join us for a guided tour of Rüdesheim. This afternoon, we’ll pass through the beautiful and romantic Rhine Valley. We’ll arrive in Cochem during the evening. Join us for an evening of entertainment. This morning, take part in our guided tour of Cochem Castle . We’ll arrive in Trier during the night. This morning, join us for a guided tour of Trier. The afternoon will be spent cruising along the Sarre and the Moselle towards Remich. Join us for an evening of entertainment. This morning, join us for a guided tour of Luxembourg. This afternoon, join us for a visit to a winery complete with a tasting. After our excursion, we'll return on board our ship. Tonight is our festive gala evening. Enjoy breakfast on board this morning before disembarking at 9:00 a.m. You’ll return to Strasbourg riverport by coach. End of our services. Your cruise with all meals from dinner the first evening to breakfast on the final day • onboard drinks included (except for drinks from our special lists) • double-occupancy cabin with shower in bathroom • assistance from our onboard multi-lingual host/hostess • welcome cocktail • gala dinner • onboard entertainment • travel assistance and repatriation insurance • transfer by coach between Strasbourg and Remich • the excursions mentioned in the program • all port fees.